How is your relationship with money? Mine isn’t terrible, but a recent (and very overdue) catch up with my accounts made me cringe a little at all of the unnecessary, meaningless purchases I make in a month. When you couple that with a growing passion for minimalism (which I define as: living more simply, being more intentional with my belongings, surrounding myself with more of the things I love), I decided it could be a good opportunity to reset some of my spending habits. Having seen a few others online giving something similar a go, I decided to quietly hold my own no-spend month over March and the results were pretty interesting. I expect many of us have found ourselves clicking through websites without thinking, or using a quick scroll through our favourite online shops as a means to procrastinate. Procrastinating in this way really is a habit, something lots of us do without thinking - and just like mindless social media scrolling - it can be hard to stop. But in setting aside a clear, defined period of time where we simply don't allow ourselves to shop, we can help retrain that part of the brain. This was something I found surprisingly difficult during my no-spend month - but illuminating in itself that I spend so much of my time mindlessly browsing when I should be working or writing. With better focus comes better flow. It's only natural - if we're more focused our staying power is greater and helps us hang in there at our desk a little longer. 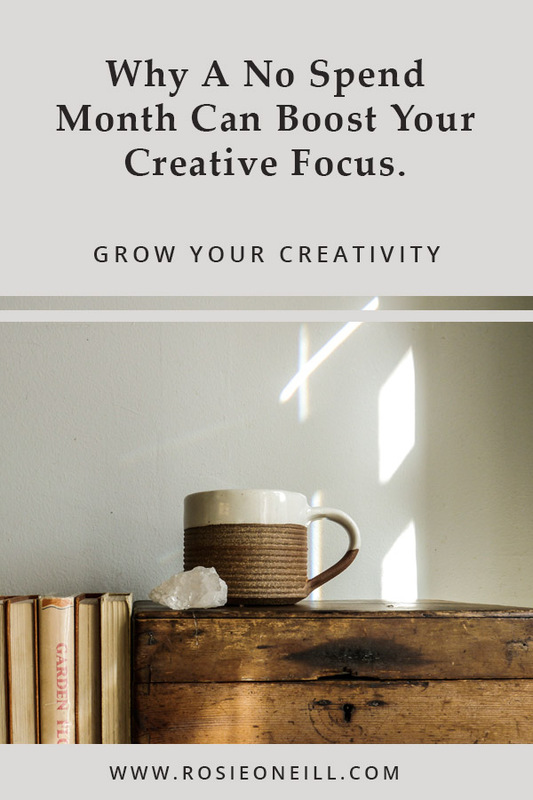 By getting into more focused and consistent periods of creating - we find it easier to find our flow and feel more at ease with the creative process. I found it so much easier to settle into a writing session without the distraction of online browsing. As a result, I was also able to plough through some of scenes I was putting off writing, write better for longer, and generally reach a higher, better quality wordcount. When we curb some of the ways we spend without really thinking, we're able to hone in on what it is we actually care about. Getting more mindful and intentional about how we spend can be really illuminating in showing us the things we want more of, the things that will really make a difference to our lives. My no-spend month really helped me to identify some key areas of my life I actually do want to invest in - gaps in my wardrobe or next steps for my business - rather than the reactive, shopping-in-the-moment style of spending. By introducing a few habits into your routine that don't involve spending, you might find you're starting to build a slower, more simple lifestyle for yourself. Filling your time with walking, reading, journaling or making are all fantastic ways to distract yourself if you're struggling with a no-spend month, and provide positive opportunities for self-development. Because I was getting more done in my shorter bursts of focused work, I had more time to do the fun things that help to refill my creative well and restore my energy. Living a little a slower, embracing a more intentional lifestyle and spending time instead of money with myself have been very beneficial in my day-to-day. - Plan for not spending. When you make up your schedule for the week or day ahead, plan in things that don’t cost anything. Make sure your rewards or rest time are things you can do for free - rewatching a film you already have, having a creative session with materials saved up in your craft cupboard. - Keep a note of the things you find yourself wavering on. If there’s something you really want to buy, write it down and forget about it. Saving your spending until the end of the month is a really good way to work out if you really wanted it or if it was an impulse.